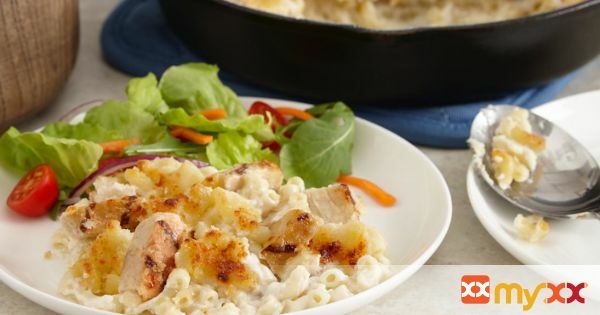 Skillet Chicken Mac and Cheese- made with precooked chicken, parmesan and mozzarella cheese. 1. Whisk: Heat a medium cast iron skillet over medium-high heat. Add butter and melt until it begins to bubble or foam. Whisk in flour and cook for 30 to 45 seconds. Then, whisk in milk and bring to a boil. Once milk begins to boil, remove from heat. Add in mozzarella and 1/2 cup of Parmesan cheese, a handful at a time, until melted. 2. Stir: Stir in the cooked macaroni and the chicken until well combined. 3. Top: Top the macaroni mixture with the remaining 1/4 cup Parmesan cheese. Sprinkle breadcrumbs over the top of the cheese. 4. Broil and Serve: Turn broiler on low and place skillet under broiler. Broil until the cheese and breadcrumbs are browned, about 5 to 7 minutes. Cool slightly before serving.